There have been many different mechanisms of bringing the game of Australia football to the world. And while Aussie rules football might not be new to Indonesia and even to Bali the game is still largely unknown by most Indonesians. A group of school children in Bali have been experiencing an education in Australian football over the past few weeks and this weekend will take part in a tournament to be played in the new AFLX format. The organisation that is putting in all the hard work to make this happen is Via Sport. Via Sport provides innovative education programs for students & volunteers through utilising sport as a medium for diplomacy & development. Mumbai Footy, in association with Reclink India and Reclink Australia, has commenced the promotion of their 2018 All India Footy Carnival to be played in October. According to their press releases and accompanying itinerary for Australians to travel over to Mumbai for the events, visitors and local fans alike will be treated to an amazing football experience. Sometimes you just have to admire the tenacity of some footy clubs. Even when obstacles seem to be insurmountable, the Pink City Footy Club in Jaipur continued to find ways to develop – with or without equipment, money, supporters or things that most clubs would consider “givens”. 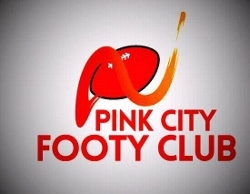 What the Pink City club has in spades, however, is tenacity and a genuine love of Australian Rules football. When the club received a set of footballs from Australian club, Pyramid Power, a couple of years ago, they were practising in a creek bed. Due to the unique terrain in which they were training (sand, rocks, broken branches) the footballs lasted about six weeks before needing to be replaced due, mainly, to punctures or other premature deaths. But D’Costa David is a young man with a vision. He wants his beloved Pink City team, based in Jaipur, India, to reach the national level. He has watched the growth of the game across India with joy, and especially the Jaipur-based over-arching team – the Rajasthan Eagles. When the team was first forming for the 2017 International Cup Anslam Diaz as proud Sri Lankan expat in Australia was excited to the he might be able to play for Sri Lanka. But eventually as the rules were understood as to eligibility it became clear Anslam would not qualify as he lived majority of his life in Australia. He was obviously disappointed he couldn't play, but that did not stop him taking part. He was at almost every training session of the Australian based players in the lead up to IC17. He found the team sponsorship, he ran water and he was the runner for all of Sri Lanka's IC17 matches. 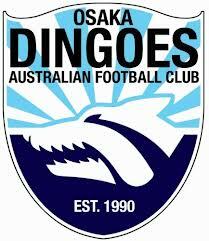 On Thursday, a wonderful announcement was made by the Osaka Dingoes AFL Club and AFL Japan. They have gained a partnership with the Kobe-based Canadian Academy. - Complimentary ground bookings have been offered by the Canadian Academy to the Osaka Dingoes and AFL Japan in a certain months in 2018. - Canadian Academy's PE staff members will get opportunities to gain coaching and training skills for their students, with the training and development coaching program conducted by Matt Gale, the President of AFL Asia and the Osaka Dingoes. 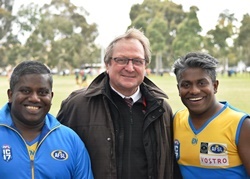 Australian Football Sri Lanka continues to forge forward to build the game in Sri Lanka following their debut at 2017 AFL International Cup in Melbourne. 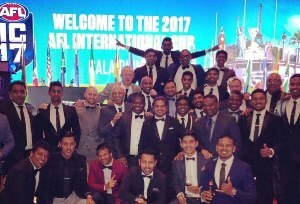 It was today announced that Australia Football Sri Lanka (along with the Himalayan Leopards) have been granted Associate membership of AFL Asia. On Saturday 20th January, the Cambodia Apsaras hosted the Malaysian Warrior Women for the Warrior's first International match at International School of Phnom Penh. Great energy and atmosphere was created for the Australia Day match by playing music and providing a BBQ and beers for all to enjoy. There were cheer squads from their men's counterparts supporting the girls enthusiastically while they were playing hard on the field. Approximately 120 people attended the memorable female footy match. The immaculate ground condition as well as its size and quality impressed the Malaysian club when they arrived, commenting that the footy field is one of the best in Asia. We welcome Yoshihiro Imagawa to our writing staff. Yoshi is a huge St Kilda FC fan and has been a regular contributor to The Footy Almanac the past few years and is now assisting AFL Asia and AFL Japan to get their footy news out to the world. 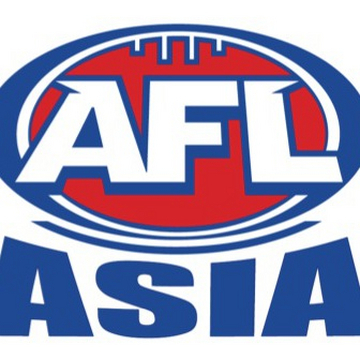 On Friday, AFL Asia announced proudly and with delight that Hayley Leary had been appointed as AFL Asia AFLW Promotion and Development Officer for the 2018 season. 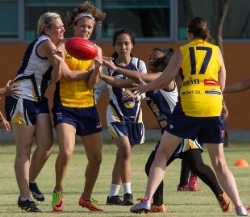 Grown up in Melbourne and currently based in Kuala Lumpur, Malaysia, Hayley participated in the AFL Asia 2016 Asian Championship AFLW Exhibition match in Ho Chi Minh, Vietnam. Her great experience in playing footy in the exhibition match drove her in co-founding the Malaysian Warriors Women's team in 2017. On Saturday, 20 January, the Malaysian women club will be playing against the Cambodia Apsaras in Phnom Penh, Cambodia. Nat Edwards from the www.afl.com.au website reports on the AFL’s latest bold move to use the new to be revealed AFLX football format as a key weapon in growing Australian Rules football in both China and India in coming years. THE LEAGUE will use its new high-octane format, AFLX, to make a significant push into China and India in the future. The fast-paced, shortened format will make its debut in February across three separate tournaments starting in Adelaide on February 15 at Hindmarsh Stadium. Melbourne will host the second lot of AFLX round-robin matches at Etihad Stadium on February 16, before the game heads to Allianz Stadium in Sydney. For a number of years the Osaka Dingoes in Japan were one of the mainstays of the national league in the country. For a good few years, the Dingoes were right up there with the Tokyo Goannas as the teams to beat. However, in a world of change, things didn’t stay the same, and the once mighty Dingoes fell on harder times as their club and the league around them looked at changing the footy landscape – for a number of reasons. The end result saw the Osaka Dingoes stand on the edge of a precipice and look down into the void of footy oblivion. Part of Japanese footy history and nothing more. But that didn’t happen, and Matt Gale, president of both AFL Asia and now of the Osaka Dingoes, tells the story of how close the club came to extinction and how they have found their way back. It hasn’t been an easy ride, and at times has been fractious, but the end result is one of confidence and potential.